This elderly German couple dance because they love it. But since a video of them performing went viral, they have now become internet superstars. But not because their dancing is just ‘cute’; because they are seriously talented. If we needed any more reason to take up dancing, this sweet German couple has certainly convinced us that it’s a good idea. It looks like dancing keeps you fit and healthy, no matter how old you get. Nellia Ehrentraut, 64, and husband Dietmar, 70, dance the jive so well, that it’s hard to believe their age. Their moves are so good, they could make younger dancers envious. The elderly German couple dance to Johan Blohm & The Refreshment’s ‘Down The Road Apiece’ and the internet has fallen in love with their energetic moves. After the couple’s first dance video went viral, they were invited to perform at the International Dance Teacher’s Congress INTAKO in Dusseldorf. The sweet pair danced the jive to many adoring fans and dance professionals. Needless to say, everybody loved them! Their infectious dance routine has been watched on Facebook by over 62 million people and has been shared over 1 million times. That’s pretty impressive going for any professional dancers, never mind an adorable old couple who do it for fun. The married couple says they have been dancing for over 30 years and have no intentions of stopping. They have won many awards for their dances, predominately in the style of the ’30s, ’40s, and ’50s. Can we bring back dance halls? I would love to spend my Friday nights dancing the night away and learning the old dance styles that our grandparents enjoyed. It seems like such a lost art that is kept alive by the older generations. We need to keep it going! 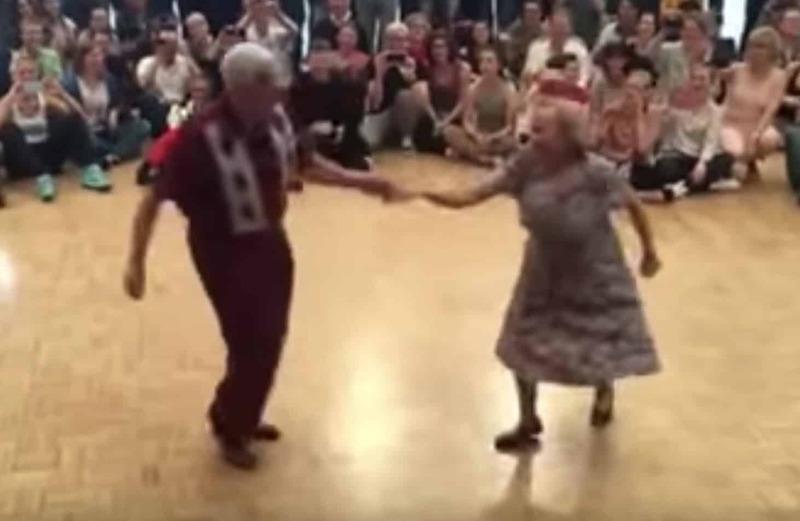 Watch the video below to see the elderly German couple dance the jive. The talented couple’s routine begins about 40 seconds into the video after they are introduced by the host.